2. YOU SHOULD RUN AND READ IT. NOW. 3. LIKE STOP READING THIS AND READ THAT. 4. IT IS PERFECT. AND REAL. AND DARK. AND SWOONY. AND FILLED WITH EMOTION. AND PERFECT. In case you want a why, though, here we go. Cassie is your resident social outcast. Cassie can hear voices in her head. Cassie’s dad cares more about his restaurant and the bugs in his garage than his own daughter. The voice in Cassie’s head tells her she can’t talk to people, or she’ll harm her. Cassie can’t read all the books she likes, or the voice will harm her father. The voice wants her to solve the murders of missing women; a serial killer called The Houdini Killer. The voice wants a lot of things, and Cass can’t deliver on all of them. This is her story. The story about how she sees her cracks, in all their entirety, and how she manages to put them behind her. This is about how Cassie fall in love, and comes out of her shell. This is about how she understands what it means to be a friend, and how to forgive. This is about life’s hard truths, and how sometimes, there just is no answer, and you have to find closure anyway. This is about family and forgiveness, and it’s beautiful. 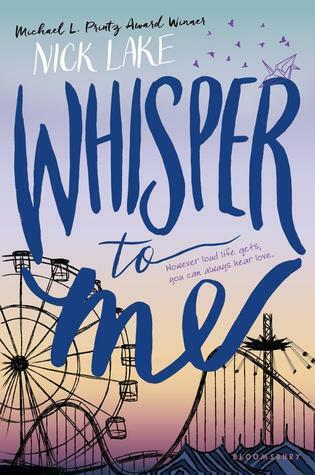 What I especially loved about Whisper to Me is the sheer importance and the volume it gave to the mental illness itself. I recently read Emery Lord’s When We Collided, and I said that Vivi’s mental disorder felt like a quirk and not something that was really talked about, but Nick Lake has managed this BEAUTIFULLY. It was done with just the right amount of seriousness, the perfect balance of healing and breaking down but most of all, everything about this seemed so REAL and so plausible, really making the reader understand what someone with a voice in their head might be going through. Another thing that made me fall in love with Whisper to Me was the fact that it was about so MUCH MORE than just one boy, and I truly mean that. This book was a love letter, BUT IT WASN’T JUST ABOUT TWO PEOPLE AND BACKGROUND. This has family and friendship and disease and healing and murder and it was PERFECT. If you gave me the chance, I would rant on forever. For Whisper to Me is that rare contemporary that only comes oh-so-rarely. The next Sarah Dessen is here. What is the best book you've read about a mental illness? What is your favorite contemporary novel? Have you ever read Sarah Dessen? Well, this is exactly like your favourite novel of hers.